Ian Britt, a singer/songwriter from the UK with soothing vocals and a good ear for melody. A friend of mine recently mentioned he is about to release a new album and I kept scratching the back of my mind to remember where I heard his name before. A month later I realized I’d actually seen this guy open for Milow awhile back. So that was one mystery solved. I went back and looked at my recap of that show, and while I didn’t write too much about his support, it seemed like I categorized it as pleasant and promising but not quite there yet. In the past few weeks I went back to Britt’s previous work. His debut full-length “One Day I” has a few interesting songs on it, and songs like Conquer The World and Life Ain’t Made showed real promise, but as a whole, the album was fine, not superbly memorable. The EPs Britt released in the following years (“Big Light” & “What Ilk?”) were definitely more solid as a whole, and songs like The Shape of Us…, Instincts… and Lost & Won were actually quite convincing. So I was very curious for “BOX”, hoping the progression and consistency are still continuing. And right from the start, “BOX” has a convincing, complete sound that balances between a more traditional singer/songwriter approach and a more upbeat radio pop/rock feel. On his previous albums Britt already showed he puts effort in his songwriting. A well written song is the basis of his work, and that hasn’t changed. He’s just become a lot more consistent and with a couple years of experience under his belt he’s become a stronger musician. Lead off track Back Home is infectious, acoustic rock that lends itself excellently for foot tapping and humming along. And the album features a few more of these songs (Walk Alone, Boom Boom) but while these songs are quite good and a lot of fun, Britt’s real strength lies in the passionately performed singer/songwriter songs like Me & My Friend Cupid, Run Lola Run, Crazy Jane and the beautiful Pretty Little Flowers. The beautiful arrangements and personal delivery of these songs create a more direct connection between artist and listener, which is exactly why Ian Britt nailed it on this new release of his. More than before he is playing to his strengths and his beautiful, honest, direct lyrics and melodies are coming across perfectly because of it. I am not entirely certain who Britt would list as his main influences musically but listening to BOX I would say there is some Paul Simon, Nick Drake, Steve Miller and a touch of James Taylor in there. Maybe it’s just me making these connections, but I think it gives you somewhat of an idea in what spectrum of the genre one could place Ian Britt. There is a new generation of singer/songwriters (Ben Howard, Joey Ryan, Alli Rogers, Milow, Josh Ritter, etc.) that writes pop songs with the same sincerety and connectivity as those artists did. And I would most definitely list Britt in that same category. “BOX” is a strong effort, and where Britt was making progress on his previous EPs, he did not just take another step forward on this album, no, I would say he actually leapt forward, because “BOX” is a an album filled with beautiful songs that fit together well and yet have enough variety to keep your attention throughout the whole album. It doesn’t become too much of the same and there are new things to discover after several listens. I said it before, but 2010 is a good year for the singer/songwriters, and Ian Britt’s “BOX” is another confirmation of that. Ike Reilly’s been around releasing records since the early 90s, but surprisingly he’s still a relatively unknown artist. His contemporary rock & roll is creative, relevant and performed with honesty and passion. With lyrics that touch current, relevant subjects like international relations, war and peace, economy, and much, much more, and essentially a pretty classic approach in delivering that message, Reilly is headlining a new generation of rock & roll artists that could eventually be the Dylans, Fogertys, MacGowens, Cash’s of today. On “Hard Luck Stories” he connects with the man on the street, the man in the pub, the normal, working man. And what Reilly does extremely well is to match the agression and intensity on the one side, and the comfort and compassion on the other side in words and music alike. “Hard Luck Stories” starts off with a jangly, 60s-influenced rock & roll song called Morning Glory. The somewhat bluesy undertone in the song is classic, just classic. The more uptempo Girls In The Backroom is like a modern version of The Pogues and brilliant songs like The War On Terror & The Drugs and Sheet Metal Moon are filled with subtleties, both musically and lyrically. The album is well balanced between more uptempo rockers and mid-tempo bluesrockers, as well as the occasional slowed down anthem or ballad. Best example of the slower songs is Flowers On Down on which this maestro is channeling a little Dylan. And you know what, Ike Reilly does it at least just as well. 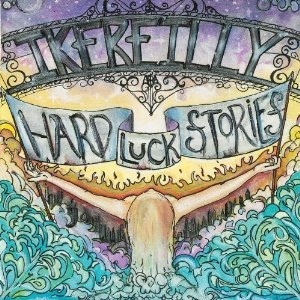 Musically and lyrically “Hard Luck Stories” ranks very high in the list of albums released in 2010. While it has obvious influences from the 60s and 70s it still sounds current and even refreshing and creative. Reilly knows how to bring out the best of himself musically and therefore “Hard Luck Stories” has become a very strong and complete album that shows an experienced songwriter and musician playing with guts, sincerity and passion. You can say a lot of things about Imogen Heap, and her music may not be easily accessible to just anyone, but above all, both artist and music are interesting. Whatever you think of it, it’s never boring. She has a way of playing with sounds and influences that is both engaging and disarming. On her previous album “Speak For Yourself” it was mainly Heap’s oddness and her distinct vocals that set her apart, well, and also her style of songwriting. But on “Ellipse” she incorporates a wider range of influences without losing that odd and intriguing essence that she’s gotten known for. It would be too easy to dismiss “Ellipse” as an alternative electro-pop record. It’s too sophisticated for that. Whether the songs are about more trivial things or more pressing matters, the thoughtful songwriting and arrangements make for a challenging and somewhat peculiar musical journey. But somehow it all fits. Heap’s signature vocals, the use of clever samples and beautiful arrangements make for excellent songs need to be not just heard, but listened to. She varies between more bombastic songs like 2-1 to a somewhat poppy sound on Bad Body Double and Swoon and shows she can disarm her listeners with a more intimate song like the piano-ballad Half Life. Imogen Heap shows to be an allround artist and while you may think she is hiding behind her computer samples and ProTools a little too much (to a certain extent I tend to agree), she shows she has all the goods. The sampling and layering is a trademark that fits with the quirckiness and oddity that surrounds Imogen Heap, yet on “Ellipse” she shows she uses it but doesn’t NEED it to convince an audience. This, in my opinion, is the real growth compared to her previous album. “Ellipse” may not hold a song as commercially interesting as Hide And Seek on her previous album, but as a record it is much more complete and sophisticated and her signature sound combined with her distinct lyrical and vocal style makes for an interesting listen. The songs are powerful at times and almost sentimental at other times. Like I said in the beginning of this review, in the end you can think of it what you want, but the record never gets boring. It’s a distinct style and sound, so it’s not for everyone, but if you’re willing to listen, there can be a whole lot for you to enjoy.